This knockout (pun intended) of a cover featuring the Silver Age and the Golden Age Flashes duking it out in the lair of the villain Vandal Savage is second only to The Flash #123 in sheer iconicness and cooleration. Amazing. And the story it fronts is equally deserving of iconic stature. It neatly echoes the origin of the Silver Age Flash when, while trying to discover the source of mysterious power damping lights appearing over American cities, Barry Allen is led to checking a map of the cities on Earth Two, home of the Golden Age Flash and, not incidentally, the Justice Society. Once again, Barry returns to the comic books of his youth, this time All Star Comics and realizes that the lights are appearing over the home towns of the Justice Society heroes. In an earlier post I mentioned that I read somewhere that the Flash editor Julie Schwartz had said that bringing back the Golden age heroes was something he had envisioned from the start and this story seems to lend some credence to that. But rather than bringing back the Justice Society full bore right at the start, he and writer Gardner Fox kept teasing us in the pages of the Flash with glimpses of the Earth Two heroes. This would, of course culminate with a two issue crossover that same summer between the Justice League and the Justice Society. So Barry as the Flash returns to the Community Center stage where he first vibrated his way to Earth Two. Once there he discovers that Jay Garrick, the Earth Two Flash, has been investigating the mysterious lights (remember those?) as well. They also coincide with the disappearance of various members of the JSA in the cities where they appear. When the lights appear over Keystone (home of the Earth Two Flash), the duo sets off to investigate. When Jay discovers the device causing the lights, it turns out to be a trap and he’s captured in a transparent rectangle. Only with Barry’s help is he able to avoid being whisked off in the trap. Then in a revealing and tantalizing “meanwhile” we find ourselves in the lair of Vandal Savage and in one amazing panel we get a look at the members of the JSA all trapped in the transparent rectangles. For many of us, it’s only our second glimpse of the Golden Age Green Lantern, Atom, Hawkman and Doctor Mid-Nite, and, in those pre-internet days, it drove us nearly crazy trying to imagine what had gone before in an era that seemed as distant as the pyramids. We are also given Vandal Savage’s backstory of how, as a caveman, he was bathed in radiation from an exploding meteor which allowed him to live through the ages as various leaders and warriors. When the Flash of Earth Two fails to show up trapped in the cube, Savage personally goes out and captures both Flashes taking them back to his lair. 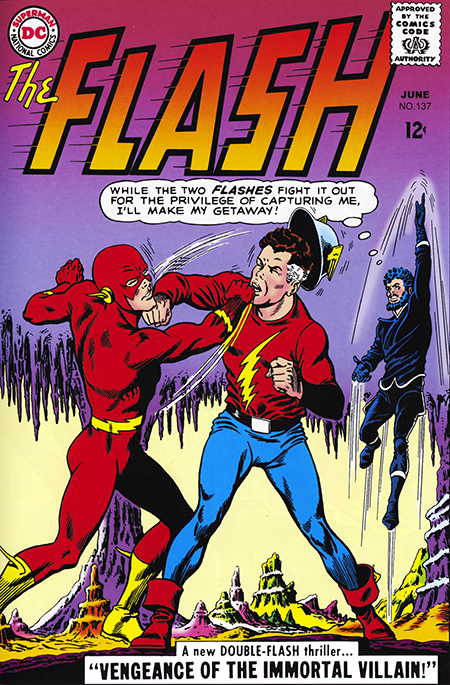 A fight ensues during which Savage forces the two speedsters to battle each other. Through a ruse, the Flashes defeat him and release the Justice Society members. As they stand together, Wonder Woman muses: “You know, boys… I’ve been thinking… it might be a good idea for us to meet every so often… come out of retirement as it were… to prevent anything like this happening again!” And so the door to the multiverse is blown off its hinges. One last word on the cover, a number of years ago at SDCC I came across the cover to this issue in a dealer’s booth. It was a little pricey at the time, but nothing compared to today’s prices for Silver age art. I thought about it, but took a pass. Sigh.